WHAT'S UP THE PIKE: TV plastic surgeon meets adoring fans at White Oak Sears; One-quarter of Guatemalan town has moved to Langley Park; Riders forced to pay fare on some Metrobuses during Code Red day. 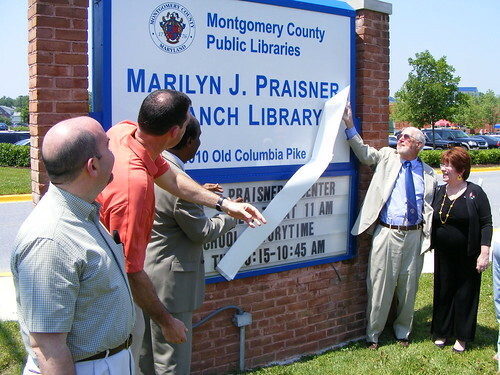 Newly-elected Councilmember Don Praisner unveils a sign dedicating the Fairland Library to his wife Marilyn as County Executive Ike Leggett and Councilmembers George Leventhal, Mike Knapp and Duchy Trachtenberg look on. Check out this slideshow of the ceremony. Over one hundred friends and supporters braved hundred-degree temperatures Saturday morning to dedicate two community facilities in Burtonsville to former Councilmember Marilyn Praisner (D-Calverton), who fought to ensure East County had the same amenities available in other areas. "I know my mother is looking down on us, shaking her head, saying 'I don't deserve this," said Alison Klumpp, one of Praisner's two daughters, during a ceremony in front of the Marilyn J. Praisner Library and Community Recreation Center, formerly the Fairland Library and Community Recreation Center. "But you do for making this community a better place for children children and adults alike." Family members, community leaders and elected officials offered memories of Praisner's life and career, which ended upon her passing away in February. Three students from Paint Branch High School played a musical tribute including a rendition of the song "My Way" by Frank Sinatra. The ceremony ended with an unveiling of three new signs - on both buildings and at the complex's entrance on Old Columbia Pike - bearing the former councilmember's name. County Executive Ike Leggett speaks about Marilyn Praisner's life as Don Praisner looks on. 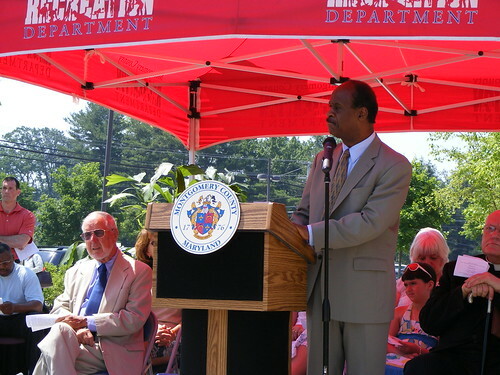 County Executive Ike Leggett, who had been close friends with Praisner for several decades, spoke of loss and rebirth. "We're saddened that we do not have this brilliant mind, dedication to county, making sure what is done is right," said Leggett, speaking slowly and deliberately. "But now it is time to turn the page. A new beginning for this community . . . It's difficult because when we look at the challenges facing Montgomery County today we need Marilyn Praisner more than ever." Leggett pointed to Old Columbia Pike, where Praisner had pushed for road improvements and expansion of Ride On service, as a lasting example of her work. "If you look down this street you'll see sidewalks up and down connecting schools, libraries, houses of worship," said Leggett. "We are connected because of Marilyn Praisner." Widower Don Praisner, who won a special election last month to finish the rest of his wife's term, was visibly shaken as he made a brief statement during the ceremony. "It's a little difficult for me," he said, "but I want to thank all those voters in District 4 for voting for me . . . being retired for fifteen years, it's hard to go back and get a job." Gene Neal, retired Program Manager for the Department of Recreation, talked about Praisner's fight to build the recreation center, which was not completed until 2002, seven years after the library. "Many facilities are named after people we don't even know," he said. "I don't think there's a person in Montgomery County that could say this isn't the right thing to do." 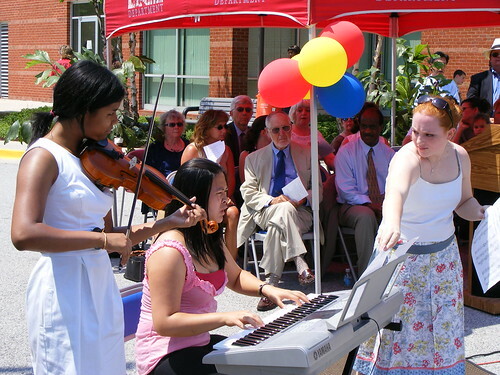 Students from Paint Branch High School, where all three Praisner children attended, play a musical tribute for Marilyn Praisner. The unveiling ceremony was a relief for Klumpp, who with other family members has attended many events commemorating her mother's life over the past four months. "It's neat to know that my mom's name will live for a generation to come," says Klumpp, a teacher at Fairland Elementary School. "This is our culminating event . . . which I'm somewhat thankful for. It's so emotional to hear all these honors." At-Large Councilmember Nancy Floreen, was glad to see the dedication made. "I think it's a great legacy for her," says Floreen, who served with Praisner since first being elected in 2002. "It's just horrible that it has come so soon . . . I still can't believe that she's not here." Burtonsville resident Stuart Rochester, who worked with Praisner as chairman of the Fairland Master Plan Advisory Committee, recalled the "easy access" he and other citizens had to their councilmember. "I could call her at work, even on vacation," he says. "No one gave more generously of her time . . . we had a wonderful personal and civic relationship." Don Praisner, who joined the County Council for its new session yesterday, expressed gratitude for the "outpouring of support" his wife received for her years of hard work. "I always questioned her 'why did you do all the things you did,'" he says, "and it's clear with all the support we've received. Even driving up and down Old Columbia Pike is still gonna bring back memories."